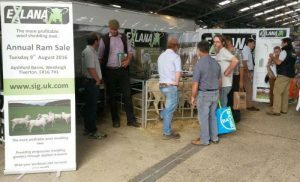 Having made the first attendance at the 2016 Sheep Event at Malvern the Exlana team were back at the event again this year. Despite the heat wave the Exlana stand in Why Hall was packed and a constant stream of inquiries continued throughout the day. 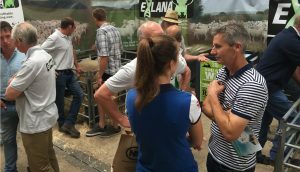 Thank you to everyone who took the time to call – we thoroughly enjoyed the day and look forward to seeing many of you at the Exlana Ram Sale on 8th August. The 2018 Malvern Sheep event was a great success! Click on the links for details of Rams in this years’ sale. Coined at it’s inception from the Latin ‘without wool’ this new high performance breed was the result of a project to find a more manageable animal, not least with a capacity for self shedding, or as press have so widely reported ‘ self shearing’ traits. The breed has been developed by ourselves and just 7 other farmers in the south west. We have adopted the ‘easier management’ philosophy for many years and it is now widely accepted within the industry as the way forward for the sheep farmer who will be managing much larger flocks of sheep in the future.